During a terrible storm, first officer Jerry Griffin does his duty and dumps $1.5 million worth of goods into the sea to lessen the danger of sinking the Janeel Trader, a cargo freighter. Once on shore, Jerry is a little surprised when he is hauled before the Coast Guard maritime court (thanks to his angry businessman brother), which may hold him responsible for the loss of the cargo, since the previous officer claims he could have saved both ship and cargo. Jerry needs Captain Bancroft�s testimony to clear his name, but the old man is murdered before the trial. Now Jerry is falsely accused of that crime too. Perry comes on as Jerry�s attorney and investigates what he feels is gross injustice. Paul gets a free trip to the Orient when Perry has him check up on the lost cargo. Film Editor � John D. Faure, A.C.E. Tudor Owen makes his first of two appearances on Perry here playing MacLean. Tudor Owen starred on radio with Raymond Burr (and also Jack Webb) on the noir action show Pat Novak For Hire. Submitted by PaulDrake 33, 3 September 2009. Sightings: The ubiquitous Little Old Lady in a Hat is present in the courtroom. You can see her sitting behind actor Edward Binns as Perry finishes with Special Officer Vogel for the first time on the stand. Despite her dour look, she does well enough to afford a string of pearls. Submitted by Kenmore, 9/12/2010. + Joining the Lady in the courtroom gallery: Pencil Mustache Man, �Miss Carmody,� �Sasha Magaloff,� and Quiet Old Man #1. Submitted by gracep, 11/23/2010. + Lastly, as someone bolts for the courtroom door, a startled Distinguished Gentleman #1 turns to watch. No doubt as you read each name, you wonder, Who Is That? Added by gracenote, 6/10/2011. Uncredited Actors: Bert Stevens sits on a seat of the board hearing testimony in the Coast Guard maritime court. Submitted by gracep, 11/24/2010. TCOT Active Art. When Paul Drake goes to Japan to check on salvage operations on the Janeel Trader�s cargo, crates with the stamp �Claver Collection � Rio de Janero� can be plainly seen behind the salvage crew. The alleged destruction of this art collection set in motion Episode #118, TCOT Torrid Tapestry. Later, when Drake and the Japanese police trace the stolen cargo to a warehouse in Yokohama, more Claver crates are present. Submitted by FredK, 2 October 2010. + I saw only one �Claver� crate, and I don�t believe that Paul was in Japan at that time. I think he was on the island seen in the establishing shot just before the scene with the crates. Paul probably flew there �by way of Guam� per earlier dialog. After Paul reports to Perry, he is sent on to Yokohama. I did not see any clearly identifiable �Claver� crates there. Submitted by daveb, 10/4/2010. Some pictures here. +Dave is right and it�s a lesson to me about relying on memory late at night while posting. The second appearance of the Claver crates is on the dock in Los Angeles when Perry, Della and David Gideon check the watchmen�s routine. As David times Perry going to the ship, he and Della stand next to two Claver crates. For the record they are stencilled �Nathan Claver Collection � Rio de Janeiro.� My apologies for the inaccuracy. Submitted by FredK, 4 October 2010. (1) A 1960 Buick-Flxible Premier Ambulance, Snyder Ambulance & Oxygen Service, transports Capt Bancroft from the Janeel Trader early in episode. "Snyder" is painted in script lettering on the driver's door. The car's colors are probably "Casino Cream" (body) & "Copper Metallic" (roof), same as in the linked Mad, Mad World image. Further down that linked page, "60buick" (the car's current owner) gives some interesting historical commentary on the roles of this and other Professional Cars in Movies & TV. Also see 60buick's comments here, click on "my car when new" to view full version with photos. This same car appears in Ep#131. (2) 1961 Buick Electra 4-Door HardTop, black, Lic No VBV 990, Charlie Griffin with passenger Frank Logan. Arrives at Janeel Trader as the ambulance leaves. (3) Perry's black 1961 Ford Galaxie Sunliner, Lic No VNE 545, top down. (4) 1961 Ford Fairlane 4-Door Sedan POLICE B&W, Lic No E 014, appears at 20:17 and 40:24. This car first appeared in Ep#110. For this episode, "13410" has been painted on the doors below "POLICE". (5) International Travelall Hearse, based on 1957-1960 International Travelall, A- or B-Series, is parked at the bottom of the gangplank, nose-to-nose with the Police-Car (4). Watch for it when Perry's Sunliner appears at 20:17 as he is passing the parked police car: the hood of the black Hearse is at left-of-screen. As the camera pans right-to-left following Perry's car, watch for the window curtains, chrome Lightning-Bolt side trim, door handles and Landau Bar on the hearse. The Lightning-Bolt, door handles, doors/windows and body shape match the stock Travelall. Pause the video on the hearse's front fender, turn the screen brightness & contrast to max and match the body sculpting around the hearse's front wheel opening to the stock Travelall. More on Professional Cars (1), (5) in Comments sect. Added by Gary Woloski, 1/17/13. TCOT Fortunate Find Not only does the salvage company have a curious haul in their warehouse, they were also verrrry lucky to have salvaged the Jeneel Trader's jettisoned cargo: the Pacific Ocean has an average depth of >14,000', but apparently the loss occurred right where it could be found easily....how lucky !! Submitted by Notcom, 122215. Character Names: Mr. Wenzel�s (Sean McClory�s) first name, as revealed during the Coast Guard hearing, is Fred. The protagonist Griffin (Lee Farr) is Jerry, but curiously that is left out of the credits, too. Submitted by gracenote, 11/24/2010. Did you notice that Tudor Owen stereotypically follows in the tradition of Scottish engineers set forth in countless movies and TV shows (e.g. Mr. Scott on Star Trek) in remembrance of Scotland�s 19th century glory days of shipbuilding? Submitted by daveb, 11/24/2010. Karl Held repeats his performance as David Gideon, which he began in #122, TCOT Grumbling Grandfather. Submitted by gracep, 11/30/2010. Although credited, Ray Collins as Lt. Tragg does not appear in this episode. Submitted by gracep, 1/7/2011. 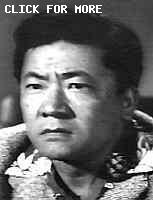 This episode introduces Lt. Anderson, played by Wesley Lau, who'd portrayed a paint manufacturer just two episodes ago. Submitted by francis, 4/25/12. + But that previous episode was filmed at the end of the fourth season. Because of CBS' arbitrary decision to withhold two episodes and show them at the start of the fifth season put the airdates of those two episodes closer together than they normally would have been. Submitted by Wiseguy70005, 2/2/15. 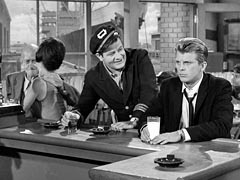 While tying all the loose ends together in the final scene, several of the characters enjoy refreshment from the Curious Coffee Set in Perry�s office. Submitted by gracenote, 6/11/2011. + Except for young Gideon, who is seen holding a glass of milk (again). Submitted by francis, 4/25/12. Both this episode and the next one (TCOT Crying Comedian) feature actors who had prominent roles in Marilyn Monroe movies. In this episode it's Casey Adams, who was in Niagara; in the next episode it's Tommy Noonan, who was in Gentleman Prefer Blondes. Submitted by 65tosspowertrap, 10/10/2013. + Casey Adams is involved in scuttling a ship in this episode, and prays for a boat to be scuttled in Niagara. Nautical Note�from 1956 to 1960 Roy Roberts portrayed Captain Huxley on The Gale Storm Show, a.k.a. Oh, Susanna. Another cast member of the that show, Zazu Pitts appeared in episode #146, �TCOT Absent Artist.� Submitted by Masonite, June 28, 2011. Word of the Day: When introducing David Gideon, Perry characterizes him as "impetuous if not always imprescriptible." That latter word means "not subject to prescription," for those viewers who are not so sesquipedalian. Submitted by francis, 4/25/12. The 1960 Buick-Flxible Premier Ambulance was built by the Flxible Co. on a stripped 1960 Buick Electra chassis, model 4730. "Premier" was the Flxible model name for its longer-wheelbase cars. See this and other Flxible cars here. Comprehensive article on Flxible Co here. Here are three photos of the other surviving '60 Buick-Flxible Premier Amb mentioned in his forum posting by 60buick. He also mentioned here that, as well as Mad, Mad, World, his own car appeared in Twilight Zone "Nightmare at 20,000 Feet", The Fugitive and "An episode of Perry Mason". I conclude that his car is one-and-the-same as the ambulance appearing in this episode #127. Added by Gary Woloski, 1/18/13. I'm convinced that the hearse is a converted 1957-1960 International Travelall. Yet I'm unable to find any conventional reference book or internet record that such a vehicle existed. It appears that very few were made and that there are no known survivors. The most likely candidate for a company that may have produced the hearse in this episode is Springfield Equipment Company or its original parent The Champion Company, manufacturers of funeral care products and shipping containers (very much like car bodies or coffins!). Springfield Equipment Co is known to have converted International Travelalls to ambulances, fire/rescue, airport limos and school buses (scoll down), some with raised roofs and extended wheelbases. Their trucks were marketed through International Harvester (IH) dealers; see 1966 ad here. This is just my best guess. Maybe this vehicle or another like it appears elsewhere in TV or the movies, or maybe there is mention of it in Los Angeles-area archival material. Perhaps someone will find something with a CHAMPION logo on it in the desert East of LA. Added by Gary Woloski, 1/19/13. I recommend this short, interesting article "Movie and Television Ambulances" by Louis C. Farah from the March 2010 Professional Car Collector magazine. Added by Gary Woloski, 1/19/13. + There was only one ambulance. When this same car appears in ep#131, the "AMBULANCE" lettering is seen to be on a card taped over the "Snyder" lettering. Snyder Ambulance Service, Van Nuys Cal, was a real company. Apparently the inaugural occultation was done in the middle of this ep#127 shoot. GSW 11/12/14. Into the mouths of babes this is the second time in three episodes that the question is raised as to whether/not David is "old enough"(to be in a bar); and how does he answer the challenge ??? As indicated above, he orders a glass of milk (he does forgo the straw, however). Noted by Notcom, 010317. When Perry begins his final browbeating of Janeel (Roy Roberts) into confession, he takes a sheet of paper from a file, turns it over to a blank side and pretends to read the chain of events leading to the murder. Can anyone figure why it would be more effective to recite this rather than simply stare him down and state the obvious inferences with the usual Perry glare and tone of voice? Submitted by FredK 5 October 2010. + Sure. Perry wanted Janeel to think he was reading a detective's report or some other document suggesting there was a witness to events, thus reducing in Janeel's mind his "plausible deniability." Without any real evidence against Janeel, a bluff is all Perry had. (Of course, it always works.) Submitted by francis, 10/01/14.